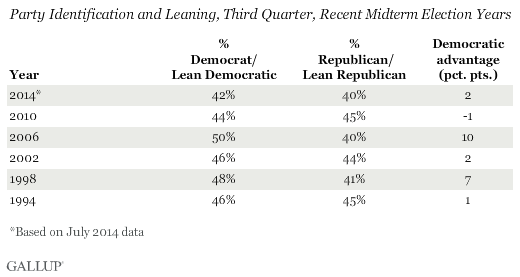 As my colleagues and I have been writing for the last few weeks, a clear “enthusiasm” gap is opening between Democrats and Republicans, with Democrats more engaged (or is it enraged?) than their GOP counterparts. We are seeing a drop in “strong” approval for President Trump as well as less than robust turn-out from GOP voters in special elections in Kansas, Georgia and Montana. The latest example of this enthusiasm gap is the drop in the percentage of Americans who identify as Republican. Polling taken in May by Gallup finds 45 percent of Americans identify themselves as Democrats and 38 percent identify as Republican. The seven-point gap is the largest recorded by Gallup since April of 2015. With Trump’s overall job rating stalled in the high 30’s to low 40’s and the GOP- controlled Congress yet to rally around (or pass) a significant legislative agenda, it’s not surprising to see fewer Americans identify themselves as a Republican. Think of party identification (do you identify as a Republican, Democrat or independent), like the “bandwagon” effect in sports. The better your team is doing, the more likely that you will follow their games, wear their gear, and proudly tell people you are a fan. But, when your team starts losing, the gear goes back into the closet, the TV is tuned to another program and you give your season tickets away to anyone willing to go to the stadium. But, before Democrats get too excited about these latest numbers, it’s important to note that there has not been a corresponding bump in the percentage of Americans who identify as Democratic. As Gallup writes, “the Republican decline has been offset mostly by a three-point increase in the percentage of Americans with no party preference or leaning.” In other words, voters may be souring on Republicans but that doesn’t mean they are transferring their allegiance to Democrats. Still, a gap this big should worry Republicans. In fact, looking back at third quarter (summer to early fall) data in midterm election years, we find only two other instances since 1994 where Democratic voters had a party ID advantage as big as the one they have today. In the third quarter of 2006, when Democrats picked up 30 seats and flipped control of the House, their advantage on party ID was 10 points - 50-40 percent. The third quarter of 1998 found a Democratic advantage on party ID at seven points – 48 to 41 percent. They won 5 seats that year – the first time since the Civil War that the party of the president picked up seats in a second-term midterm election. Obviously, we are a long way away from the third quarter of 2018. There’s still time for Congress and the president to right this tilted ship. There’s also the possibility that Democratic intensity – which is red hot today – does not burn as bright in 2018.